These true bugs only attack plants that are stressed, usually from being out of their season. Cool season vegetables that have lasted into hot weather commonly welcome this this pretty insect pest. If this is a problem your plants suffer from it's time for the plants to go into the compost pile. 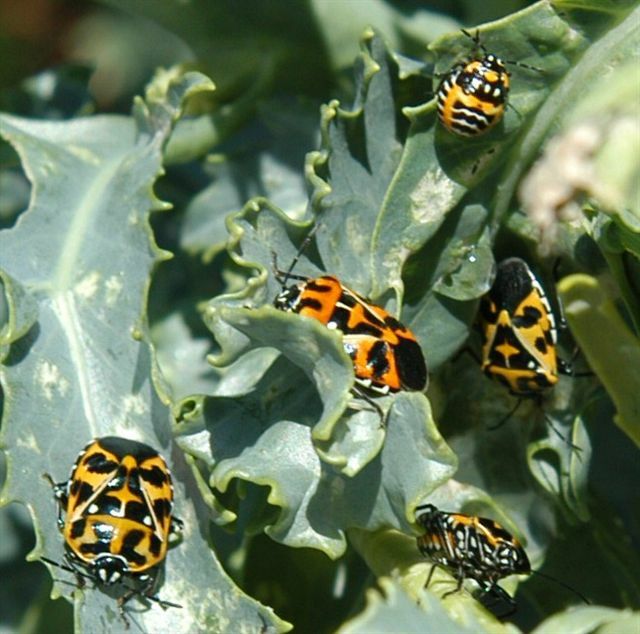 Adult--1/4" to 3/8"Adults are red (or orange or yellow) and black, shiny,flat and shield-shaped true bugs. Eggs are very distinctive. They look like tiny white barrels with black rings and are laid in two straight rows. Nymphs are red, orange or yellow and black, and oval in shape. They breed year round and can have several generations a year. Adults hibernate in plant debris. Habitat: Many food crops such as beets, brussels sprouts, squash, cauliflower, cherries, citrus, collards, horseradish, kohlrabi, peas, mustard, radishes, turnips, tomatoes, and corn. Vegetable garden vegetables, especially mustard, broccoli, cabbage, turnips, and radishes. 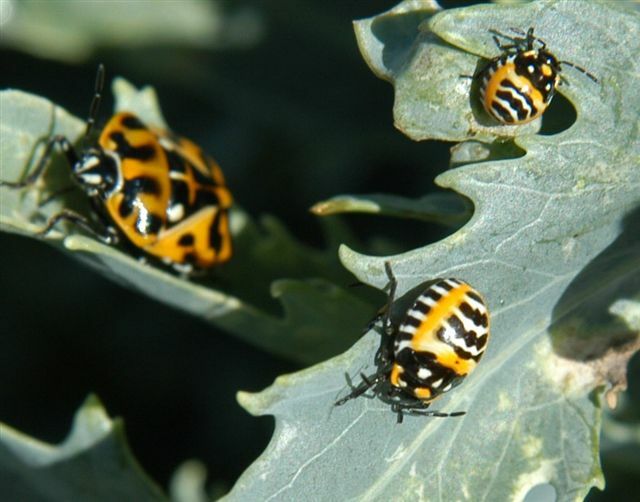 Both the nymphs and adults feed heavily on all members of the cabbage family, causing light splotches, shriveling, and deformity. Can destroy a garden in a hurry. Control: Biodiversity. Plant food crops in the proper season--the fall. Encourage birds. Plant "trap" crops of mustard, turnip greens, and the like. Spray with manure compost tea, seaweed, molasses, vinegar, and citrus oil. The harlequin bug migrated up from Central America and became a big pest in the garden. The best control is planting mustard, cabbage, turnips, and related plants early in the spring season so they are out of the garden before the middle of March. Or better yet, plant them in the fall. Harlequin bugs are ranked as the biggest pest of the mustard family, but they rarely ever appear in the fall of the year. When planted in the fall, the mustard and cole crops will not bolt and go to seed or turn bitter as fast. In the fall, these plants mature as the days are getting cooler and shorter, which gives them a better flavor. When planted too late in the spring, these bugs move in fast. Could this bug be telling us "Look, dummy, you are planting these plants in the wrong season"? If we would just pay attention, maybe all of the little critters have something helpful to tell us. When studied, all the insects, even the troublesome ones, are interesting. The most fascinating thing about the harlequin bugs is their eggs. There are always ten in a bunch, two rows of five side by side, and they look just like little wine barrels. You can see the "hoops," the "cork" in the center, and the "staves" casting a shadow across the top. 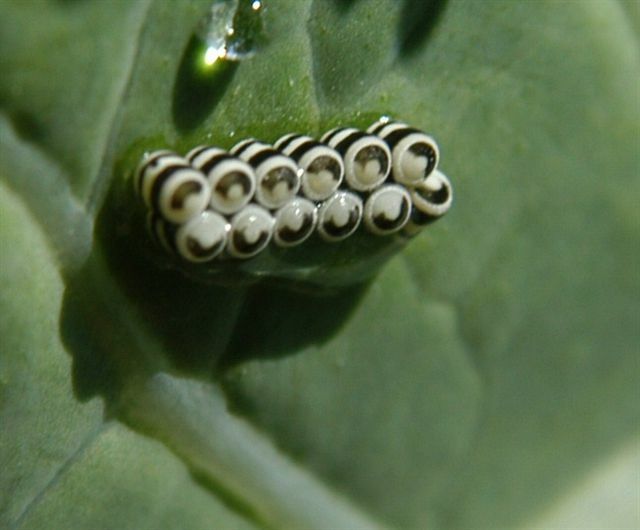 It is worth growing at least one mustard plant in the late spring just to get a look at the eggs.